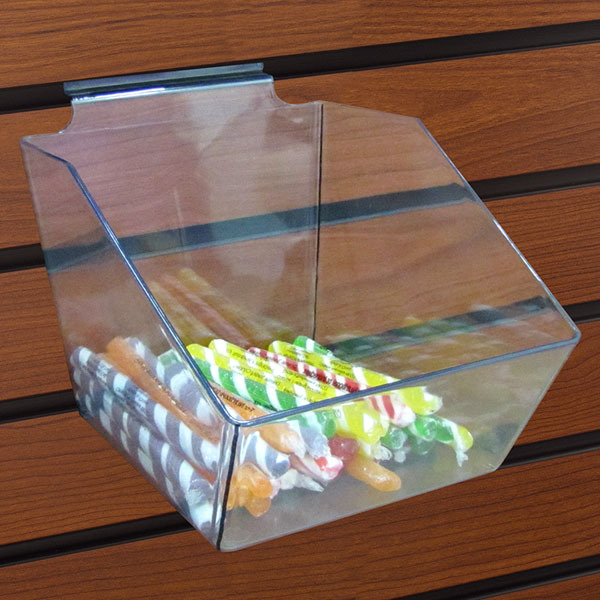 Acrylic bins are perfect for bulk and individual candy display! Acylic bins are ideal for impulse candy sales throughout your store. Angled opening gives the customer easy access to product. These bins can help you maximize space; bins stack tightly on slatwall or slatwall displays. This candy display can hold up to 5 pounds of product. While designed specifically for slatwall, bins can be optimized for grid with Grid Adapter #4411 or for pegboard with Pegboard Adapter #4412. For even more offerings, we encourage you to make time to shop our extensive array of candy displays at Specialty Store Services today.